A preposition cannot be followed by a verb.Verb placed immediately after preposition must be in gerund form. Examples (a) He prevented me from drinking cold water. (b) He insist on trying again. When 'object' of the preposition is an Interrogative Pronoun What, Who, Whom, Which, Where etc., the preposition usually takes end or front position. Examples (a) What are you thinking of ? (b) Who were you talking to ? It used to be thought as ungrammatical, to end a sentence with a preposition, but it is now well accepted. When 'object' of the preposition is Relative Pronoun 'that', the preposition takes end position. Examples (a) Here is the magazine that you asked for. (b) This is the dish that she is fond of. When 'object' of the preposition is infinitive (to + verb), the preposition is placed after infinitive. Examples (a) This is a good hotel to stay at. (b) I need a pencil to write with. Rule 5. In some sentences, preposition is attached with the verb (These verbs take appropriate preposition with them). Examples (a) I hate being laughed at. (b) This I insist on. Rule 6. 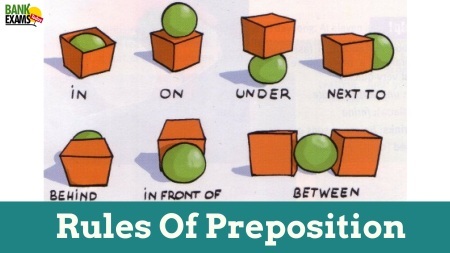 In some cases the preposition comes in the beginning. These are usually interrogative sentences. Examples (a) By which train did you come? (b) For whom was instructions given? i. At is used for a precise time. ii. In is used for months, years, centuries and long periods. iii. On is used for days and dates. i. At is used for a point. ii. In is used for an enclosed space. iii. On is used for a surface. (A) At shows stationary position or existing state while In shows movement. Examples i. She is at home. ii. The train is in motion. (B) At for small place, town etc. while In for big place, town, city, country etc. Examples i. He lives at Alwar in Rajasthan. ii. A temple is situated at Madurai in Chennai. (C) At is used for Point of time, and In is used for Period of time. Examples i. The train will arrive at six in the morning. ii. He will meet you in the morning. (D) In/Into In shows the existing state of things, while Into shows movement. Examples i. He jumped into the river. ii. There are three students in the class. In can also be used as an adverb; Come in = Enter. Get in (into the train). i. In the direction of Turn to the right. ii. Destination I am going to Jaipur. iv. Compared with They prefer hockey to soccer. v. With indirect object Please give it to me. vi. As part of infinitive I like to ski; he wants to help. vii. In order to We went to the store to buy soap. viii. To the inside of We stepped into the room. ix. Change of condition The boy changed into a man. On can be used for both existing position and movement. Example (a) He was sitting on his bag. (b) Snow fell on the hills. Onto is used when there is movement involving a change of level. Examples (a) People climbed onto their roofs. (b) He lifted her onto the table. With is used for instruments, and By is used for agents. Examples (a) The snake was killed by him with a stick. (b) The letter was written by Suresh with a pencil. Examples (a) It has been raining since two O'Clock. (b) He had been ill since Monday. Examples (a) He left school in 1983. I haven't seen him since. (b) It is two years since I last saw Tom. Beside and Besides have altogether different meanings. He was sitting beside Sarla. Between is normally used for 'two things or persons, but it can also be used more, when we have a definite number in mind and there is a close relationship/ association within them. Among is usually used for more than two persons or things when we have no definite number in mind. Both have the same meaning. Either of them can be used if followed by 'the'. If followed by a word, beginning with a vowel 'amongst' be used. The use of amongst is usually found in literary writings. He distributed the toffees among/amongst the poor.